Pushpay Reviews: Overview, Pricing and Features. Pushpay is a comprehensive mobile engagement platform created for ministries and nonprofit organizations. Ideal for organizations of all sizes, Pushpay gives you access to an easy-to-navigate and comprehensible dashboard that lets you forecast recurring gifts, track new ones, and review individual transactions. 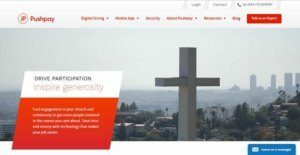 With this at your disposal, you can build a personalized experience for the members of your community and help them stay up-to-date about the happenings in your ministry or nonprofit organization. Trusted by more than 7000 customers worldwide including not-for-profits and ministries, this system is designed to help users promote their cause effectively and efficiently through the use of technology. Equipped with features like digital giving, ministry management, and financial tracking to event management, analytics, and media management, your organization can now be able to save time and money as well as increases adoption and engagement. Pushpay even has open API tools so you can extend the capabilities of the platform according to the unique needs of your organization. In case you don’t have technical expertise or can’t hire an in-house IT expert, Pushpay provides implementation coaching and offers administrative support and user support options. Customer success managers are also part of each subscription plan to help you find out how to make the most out of your investment. People are increasingly spending their time on their phone nowadays. Whether they are on their way to work or lounging around at home, there is a good chance that they will be fiddling with their mobile device. So, it is best that you take advantage of this channel to keep your members engaged. Using Pushpay’s Dynamic Homescreen tool, you can keep your audience up-to-date with your newly published podcasts, sermons, blogs, or videos. This way, they can keep participating even when they are not at church. Handling an entire ministry or nonprofit organization is already a handful. Why spend long hours handling your organization’s finances when you can be finding ways to expand your reach? With Pushpay, you can import transactions, manage donors, and reconcile finances faster. In turn, this reduces your workload, minimize duplication, and centralize all of your online and offline giving records in a singular platform. Plenty of your members as well as other individuals want to provide monetary support for the cause of your organization. However, there is a good chance that they won’t push through with the transaction if the process is too complicated or time-consuming. Simplify the donation process using Pushpay’s patent-pending solution. Using this, you can allow your members to give in seconds without the need to set up an account, type in a password, or wait in line. No organization is safe from digital threats. In order to safeguard your church and the privacy of your members, Pushpay uses industry-leading Secure Sockets Layer (SSL) technology to keep all personal information secure. They partner with reputable data storage partners like Amazon Web Services (AWS) as well as provide you with enterprise-level service level agreements that guarantee uptime and support response time. This way, you can ensure the safety of your data at all times. If you are interested in Pushpay it may also be sensible to analyze other subcategories of Best Church Management Software gathered in our database of SaaS software reviews. Enterprises have different needs and requirements and no software platform can be perfect in such a situation. It is futile to try to find an ideal off-the-shelf software product that meets all your business wants. The wise thing to do would be to customize the system for your unique wants, employee skill levels, budget, and other factors. For these reasons, do not hasten and subscribe to well-publicized trendy applications. Though these may be widely used, they may not be the ideal fit for your unique wants. Do your homework, check out each short-listed system in detail, read a few Pushpay reviews, speak to the seller for explanations, and finally choose the app that offers what you want. How Much Does Pushpay Cost? We realize that when you make a decision to buy Church Management Software it’s important not only to see how experts evaluate it in their reviews, but also to find out if the real people and companies that buy it are actually satisfied with the product. That’s why we’ve created our behavior-based Customer Satisfaction Algorithm™ that gathers customer reviews, comments and Pushpay reviews across a wide range of social media sites. The data is then presented in an easy to digest form showing how many people had positive and negative experience with Pushpay. With that information at hand you should be equipped to make an informed buying decision that you won’t regret. What are Pushpay pricing details? What integrations are available for Pushpay? If you need more information about Pushpay or you simply have a question let us know what you need and we’ll forward your request directly to the vendor.